Maximizing revenue at the point of sale is a growing focus for many Front Gate leaders. We educate our ticket sellers to be ambassadors of the facility, to engage with arriving guests, and to offer our best admission products but in order for our sales people to be highly effective, they must do more than simply "catch" sales. Today, our top Ticket Sellers (which we will refer to as Sellers throughout this article) bring a refreshing level of energy and enthusiasm to our Front Gate. Their energy can be infectious to both their colleagues and the guests with whom they engage. Having a great attitude is most certainly a large part of a successful Seller's ability to engage and to generate interest in products but to be wildly successful at both building stronger relationships and generating higher sales, Sellers need to do even more. First impressions are everything! As cliché as it might sound, the first impression that Arriving Guests form as they first come into contact with our Sellers is foundational to controlling the sales dialogue. Ticket sellers who make a great first impres sion send a message to the guest in front of them that they are focused, respectful, and ready to serve. There are two key components to making a positive first impression: looks and actions. Physical looks matter. A Seller's appearance, cleanliness, and attention to detail impacts the first impression they will make with their Arriving Guests. For example, you would never want your guests focusing on a Seller's bright green nail polish instead of their words and enthusiasm. Having the right look means that a Seller's outward appearance does not create an unnecessary distraction and derail the conversation. 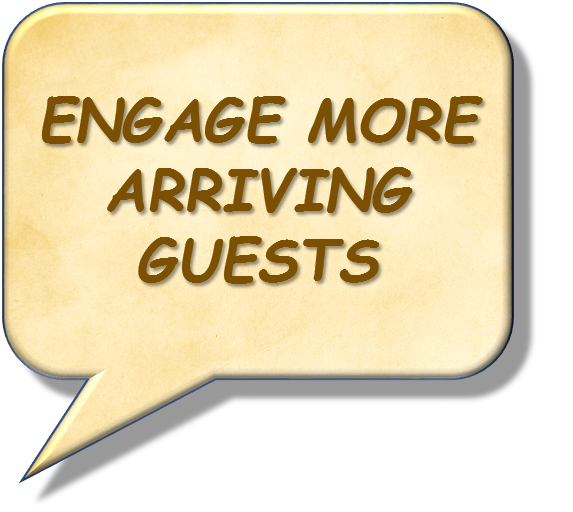 In contrast to looks, actions are the behaviors and gestures that Sellers use to engage with Arriving Guests. A warm smile and friendly eye contact send a message to Arriving Guests that the Seller is attentive to their needs. Imagine the message you send to your guests if your Seller was more focused on responding to a text message rather than engaging with the guest in front of them. For every transaction, Sellers must be not only physical present for but also mentally present.